Beware of inferior overseas imitations. All our products are made of FDA approved recyclable plastic, BPA-FREE and made in Canada where they pass through the highest quality assurance testing. 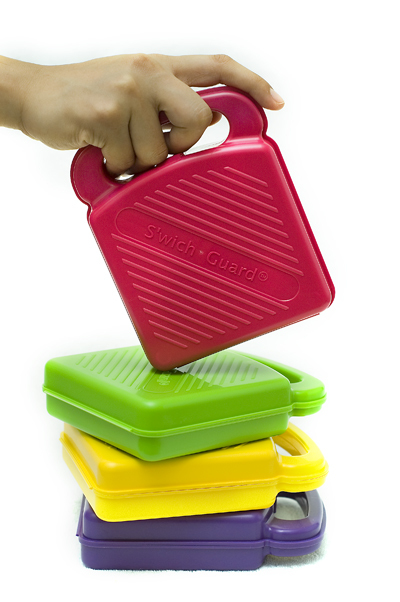 The Banana Guards, the Froot Guards/Cases and the S'wich Guards are of course dishwasher safe for easy cleaning. Now protect your larger round fruits such as apples, pears and peaches with our new Froot Guard and small fruits like kiwis and plums with the Froot Case! Now protect your sandwiches without environmentally unfriendly plastic wrap! Made to the same high standards as all our other products. The active hinge ensures you will never lose the lid. Perfect for giving ... or to keep for yourself!